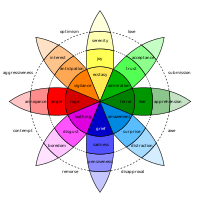 The contrasting and categorization of emotions describes how emotions are thought to relate to each other. Several proposals have been made for organizing them into groups. Humans experience emotion, with evidence used that they influence action, thoughts and behavior. Emotions are categorized into various affects, which correspond to the current situation. An affect is the range of feeling experienced. Both positive and negative emotions are needed in our daily lives. Many theories of emotion have been proposed, with contrasting views. William James in 1890 proposed four basic emotions: fear, grief, love, and rage, based on bodily involvement. Paul Ekman identified six basic emotions: anger, disgust, fear, happiness, sadness and surprise. Wallace V. Friesen and Phoebe C. Ellsworth worked with him on the same basic structure. The emotions can be linked to facial expressions. In the 1990s, Ekman proposed an expanded list of basic emotions, including a range of positive and negative emotions that are not all encoded in facial muscles. The newly included emotions are: Amusement, Contempt, Contentment, Embarrassment, Excitement, Guilt, Pride in achievement, Relief, Satisfaction, Sensory pleasure, and Shame. Richard and Bernice Lazarus in 1996 expanded the list to 15 emotions: aesthetic experience, anger, anxiety, compassion, depression, envy, fright, gratitude, guilt, happiness, hope, jealousy, love, pride, relief, sadness, and shame, in the book Passion and Reason. Researchers at University of California, Berkeley identified 34 categories of emotion: admiration, adoration, aesthetic appreciation, amusement, anger, anxiety, awe, awkwardness, boredom, calmness, confusion, contempt, craving, disgust, empathic pain, entrancement, excitement, fear, horror, interest, joy, nostalgia, relief, romance, sadness, satisfaction, sexual desire and surprise. This was based on 2185 short videos intended to elicit a certain emotion. These were then modelled onto a "map" of emotions. motivate particular kinds of behavior. The combination of these attributes distinguishes emotions from sensations, feelings and moods. The emotion annotation and representation language (EARL) proposed by the Human-Machine Interaction Network on Emotion (HUMAINE) classifies 48 emotions. A tree-structured list of emotions was described in Shaver et al. (1987), and also featured in Parrott (2001). The 2012 book The Hourglass of Emotions was based on Robert Plutchik's model, but categorised the emotions into four sentic dimensions. It contrasted anger, anticipation, joy, and trust as positive emotions, and fear, surprise, sadness and disgust as negative. Tiffany Watt Smith listed 154 different worldwide emotions and feelings. A book written by Chip Conley showed how emotions and feelings are organised using mathematical terms. The Dalai Lama made a website based on the emotions of enjoyment, disgust, anger, fear and sadness with the help of Paul Ekman. The emotions were similar to the ones found in Inside Out, a film that Paul Ekman advised. Emotions and stress are connected, so stressful situations produce emotion. Environments that make stress also make emotions. ^ Lisa Feldman Barrett. "Solving the Emotion Paradox : Categorization and the Experience of Emotion" (PDF). Pdfs.semanticscholar.org. Retrieved 2017-08-25. ^ "Emotions and Moods" (PDF). Catalogue.pearsoned.co.uk. Retrieved 20 October 2017. ^ Parrott, W. Gerrod (27 January 2014). "The Positive Side of Negative Emotions". Guilford Publications. Retrieved 19 December 2018 – via Google Books. ^ "Comparing The 5 Theories of Emotion – Brain Blogger". Brainblogger.com. Retrieved 23 November 2017. ^ Candland, Douglas (23 November 2017). "Emotion". iUniverse. Retrieved 23 November 2017 – via Google Books. ^ James, William (1 April 2007). "The Principles of Psychology". Cosimo, Inc. Retrieved 20 October 2017 – via Google Books. ^ Handel, Steven. "Classification of Emotions". Retrieved 30 April 2012. ^ "Are There Basic Emotions?" (PDF). Paulekam.com. Retrieved 20 October 2017. ^ Lazarus, Richard S.; Lazarus, Bernice N. (23 September 1996). "Passion and Reason: Making Sense of Our Emotions". Oxford University Press. Retrieved 23 September 2017 – via Google Books. ^ "Emotional Competency – Recognize these emotions". Emotionalcompetency.com. Retrieved 23 September 2017. ^ "Psychologists Identify Twenty Seven Distinct Categories of Emotion – Psychology". Sci-news.com. Retrieved 23 November 2017. ^ "Interactive web". Retrieved 2017-09-11. ^ Robinson, D. L. (2009). "Brain function, mental experience and personality". The Netherlands Journal of Psychology. pp. 152–167. ^ "HUMAINE Emotion Annotation and Representation Language". Emotion-research.net. Retrieved June 30, 2006. ^ Shaver, P.; Schwartz, J.; Kirson, D. & O'connor, C. (1987). "Emotion knowledge: further exploration of a prototype approach". Journal of Personality and Social Psychology. 52 (6): 1061. doi:10.1037/0022-3514.52.6.1061. PMID 3598857. ^ Parrott, W. (2001). Emotions in Social Psychology. Key Readings in Social Psychology. Philadelphia: Psychology Press. ISBN 978-0863776830. ^ "Basic Emotions—Plutchik". Personalityresearch.org. Retrieved 1 September 2017. ^ "Robert Plutchik's Psychoevolutionary Theory of Basic Emotions" (PDF). Adliterate.com. Retrieved 2017-06-05. ^ Jonathan Turner (1 June 2000). On the Origins of Human Emotions: A Sociological Inquiry Into the Evolution of Human Affect. Stanford University Press. p. 76. ISBN 978-0-8047-6436-0. ^ Atifa Athar; M. Saleem Khan; Khalil Ahmed; Aiesha Ahmed; Nida Anwar (June 2011). "A Fuzzy Inference System for Synergy Estimation of Simultaneous Emotion Dynamics in Agents". International Journal of Scientific & Engineering Research. 2 (6). ^ Plutchik, Robert (31 December 1991). "The Emotions". University Press of America. Retrieved 31 December 2018 – via Google Books. ^ Izard, Carroll Ellis (31 December 1971). "The face of emotion". Appleton-Century-Crofts. Retrieved 31 December 2018 – via Google Books. ^ "The Nature of Emotions" (PDF). Emotionalcompetency.com. Retrieved 2017-09-16. ^ "Plutchik's Wheel of Emotions – Indexed". Thisisindexed.com. 2012-07-06. Retrieved 2017-05-28. ^ "LNCS 7403 – The Hourglass of Emotions" (PDF). Sentic.net. Retrieved 2017-05-28. ^ Cambria, Erik; Livingstone, Andrew; Hussain, Amir (15 January 2019). "The Hourglass of Emotions". Retrieved 15 January 2019 – via Semantic Scholar. ^ Tiffany Watt Smith. "The Book of Human Emotions: An Encyclopedia of Feeling from Anger to Wanderlust" (PDF). Anarchiveforemotions.com. Retrieved 2017-05-28. ^ "Invisibilia: A Man Finds An Explosive Emotion Locked In A Word". Retrieved 2017-12-29. ^ "Happily disgusted? 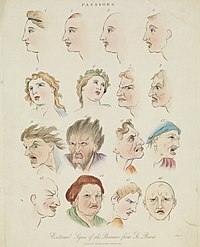 Scientists map facial expressions for 21 emotions | Science". The Guardian. Retrieved 2017-07-16. ^ Jacque Wilson (2014-04-04). "Happily disgusted? 15 new emotions ID'd". KSL.com. Retrieved 2017-07-16. ^ Conley, Chip (3 May 2012). "Emotional Equations: Simple formulas to help your life work better". Little, Brown Book Group. Retrieved 19 December 2018 – via Google Books. ^ Design, Stamen. "The Ekmans' Atlas of Emotion". The Ekmans' Atlas of Emotions. Retrieved 31 December 2018. ^ "Atlas of Emotions > Stamen Design". Stamen Design. Retrieved 31 December 2018. ^ Randall, Kevin (6 May 2016). "Inner Peace? The Dalai Lama Made a Website for That". Retrieved 3 January 2019 – via NYTimes.com. ^ Evans-Martin, F. Fay (5 January 2019). "Emotion and Stress". Infobase Publishing – via Google Books.